I briefly mentioned Maggi Seasoning Sauce before as my preferred sauce for Banh Mi Trung Ga Op La (Vietnamese French Bread with Sunny Side Up Eggs). Maggi sauce is like a liquid version of bouillon cubes. I'm pretty frugal though and the Chinese and American version has always served me just fine. Until I started food blogging. Then when other bloggers would ask if I preferred the European or the American version, I couldn't reply. And well, curiosity was really getting to me! 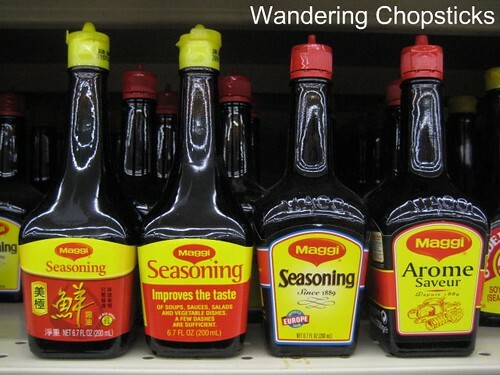 And so it was that on a recent trip to the San Gabriel Superstore I stood there staring at all the bottles of Maggi sauce. The Chinese bottle on the left and the American bottle from Glendale had the same ingredients and were priced the same. Somewhere in the $2 range for a 6.7 oz bottle. The German bottle, with a little sign that said it was imported from Europe, was $3.99. And the French bottle was a whopping $7.50! A large sized version of the French bottle was more than $22. Maggi was being priced on par with wine! While I had the bottles all lined up and was still debating whether to purchase either the German or the French versions, a customer grabbed the German bottle. Does it really taste that different I asked her? She said it was less salty than the Chinese and American versions and that she thought it was worth the extra expense. She hadn't tried the French one and thought that was priced too high. So I gave in and bought a small bottle of the German Maggi Seasoning Sauce. And bought some ho fun (Chinese rice noodle sheets) to perform a little taste test. On the left is the small German bottle of Maggi sauce. On the right is the standard American version that I'm used to. The German version had more flavor notes, but because I wasn't expecting such a different flavor, it was a little jarring at first. So I emailed Dylan of Eat, Drink, and Be Merry to ask if he had tried the French version. As he said, this was a "VERY IMPORTANT" matter, and spurred him to write yet another ode to Maggi sauce and to show off his 9 different bottles. Of course, now I think I should have sprung for the French bottle. 1 year ago today, the Year of the Pig began and I showed off the food I got from my family. I love using Maggi in food rather then soy sauce. I haven't tried the German version even though my dad loves that one more then the American version. But there is one store here that sells both the American and German versions for the same price. Might have to go get the German version to have on hand again. Hey, are those rice noodle sheets similar to the ones you sometimes get with Korean bbq? Because I've been trying to find those sheets everywhere but I don't know where to look. Are they refrigerated? Dried? Special?? Help! btw, I love your posts. I can't read them when I'm hungry, though, or I'd go crazy! when i used to live in japan and in philippines i love using maggi seasoning but in france its quite hard to find them :-) but i love them..just with my plain white rice its perfect !! I enjoyed your post and Dylan's post on Maggi sauce. Until we went to Germany to visit family in 2005, we had no idea that there were different formulas for Maggi. I had commented to Dylan that my mother-in-law hand-carried Maggi on the flight home from that trip. I had decided that the cost savings wasn't worth the effort. I was in Europe last summer, and didn't think of looking for Maggi in England and in France. Nowadays, we spring for the industrial-sized German Maggi from our local Asian grocer. Maybe we'll splurge on the French version next time. Try the French version! My parents like it the most, but I've never tried it (i think). I had no idea that there were so many different Maggi versions. Now I have to find them and check them out. Thanks! If the German version is cheap, I say go for it! I think there's more than that. That's just how many bottles Dylan has. 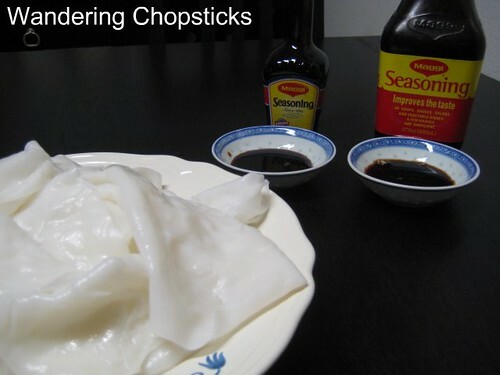 The rice noodle sheets are called ho fun and they're actually Chinese. The Korean bbq places just used these sheets and cut them up into quarters. You'll find it at pretty much any large Asian grocery store in the fresh noodle aisle. Use them within a day or two or else they'll dry out. But there's a French version! The German version isn't too bad, but the French version is pricey! I would think the English prefer their brown sauce instead. I will. When my German bottle runs out. Or maybe I need to do another taste test? You are influencing tables around the world! Based on your (and Dylan's) enthusiasm, I picked up a bottle of French Maggi (very available here and much cheaper than French Maggi stateside, of course). I've been enjoying them in my own banh mi trung ga op la...good comfort food, which provides some solace since I really miss the VN food I chowed down for over a month! I'm surprised you don't know about it already?! I bought the American version after having the French at my MIL's. Sad...it's not the same. Happy Year of the Rat!! !